New Hampton, Iowa – Detect it, treat it, defeat it is the motto for Breast Cancer Awareness Month. Pocket Full Of Posies in New Hampton has taken the motto to heart. 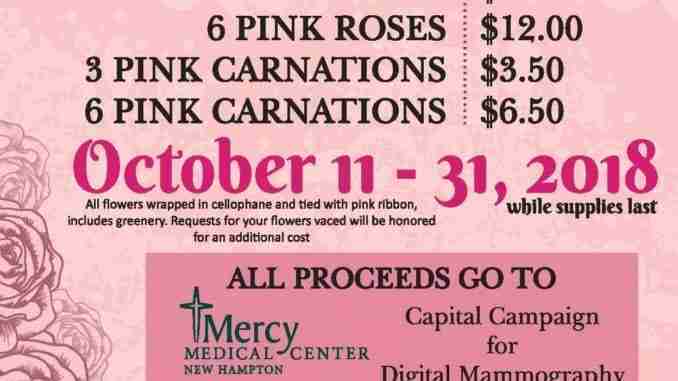 Treat yourselves to roses or carnations and all of the proceeds will be donated to Mercy Medical Center New Hampton. Kayla Smith is the store owner. The proceeds from the flower sales go towards the Capital Campaign for the hospital to purchase a 3D Mammography machine. Smith says they’ve made nearly 200 dollars in the first three days. The campaign runs until October 31st or until supplies last.